"This is a very quick and easy vegetable soup that is great to take camping or backpacking. We like it at home for just dinner too. Goes great with quick and easy flat bread recipes and the kids love it too!" 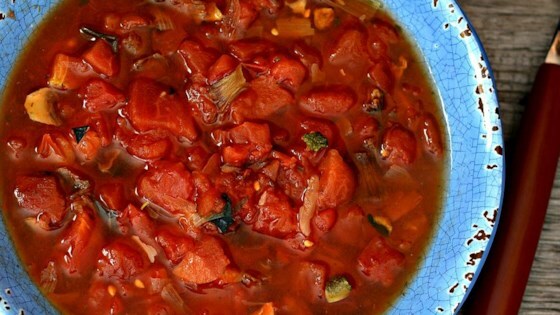 Stir stewed tomatoes and water together in a saucepan; bring to boil. Stir vegetable soup mix into the tomato mixture. Remove saucepan from heat, place cover on the pan, and set aside until the vegetables are hydrated, 3 to 5 minutes. This was just okay. VERY salty, at least for us it was. This would certainly be easy for those chilly nights camping. I used a spring vegetable mix and to add a little zip to it I added crushed red pepper flakes to taste.